WINNERS ANNOUNCED! 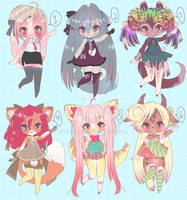 Adoptable Give Away! There is only a few more hours until the draw takes place! If you haven't entered now would be the time to do so! I will be livestreaming the draw, so if you wish to be present, be ready to attend at 6 PM EST or GMT -5! For all the help everyone has given me in the passed year, I wanted to thank you all. Without your support and purchase of commissions and adoptables, I might not even have a place to live right now. It means so much to me to have so many wonderful friends and supporters. I wish I could draw something for each of you, but I am very short on time. Instead, I hope that this giveaway will show at least a fraction of my gratitude. For anyone who is curious, the idea behind adoptables is very simple. An adoptable is a character design or fashion design which is sold to a buyer by an artist who created it. When you purchase the design you then hold all rights to the design and it can be used by the buyer in any way they see fit. That means it can become an original character for you, a new outfit for a previous character, ect. ... Essentially, as the name suggests, you are adopting the design. If you have any other questions, feel free to ask. If you would like to join in on the fun, be sure you meet the criteria to qualify, comment on this journal with a link to your own, and I will assign you a number. I will draw three winners using a random number generator and announce the winners on November 21st 2012 @ 6 PM EST. ii. Post a journal with a link to this journal so others can join in, too! iii. Be willing to never sell or trade the design you win, unless it is between the three winners. noooo... ja też T^T Cóż. Muszę się obejść smakiem. Can I give a try? ;; ;; I made the journal a long time ago but forgot to show you, sorry, so sorry. Of course I will post and note winners. This is just so people can see that the draw is legitimate. I had some accusations last time with just a screenshot. orz am I too late? [WINNER ann.] Adoptable Give AwayThe winner is #30.
ii. Post a journal linking to this journal. iii. Never sell this adoptable. This give away will accept entries until January 24th, 2013 at 10:00 PM EST (GMT -5). When you post a link to your journal on this journal I will give you a number. If I draw your number, via Livestream @ random.org, you win the adoptable. It can either go to you or one of your friends. All you have to do is make a journal linking back to this journal, and post the link here. On the.... 31st? I guess I'll post a winner. Also, only post from ONE Account, if you have say... A main and an adoptable account. Free Premium Membership Raffle! - Closed -I've been meaning to do one like this for a while, and this seems like the perfect time to do it! But what exactly will I be giving out? Now what are the rules about this raffle? 1. You don't have to be a watcher, but I'd love it if you'd check out my gallery ^^ but do as you will ~ it won't affect your ability to participate! The winners are number 57 and 93!!! Which are Veegal and o7Mizu !!! I'm giving away two 100 points to two random people! Leave a comment on this journal. Say anything you'd like. Since this is for my watchers, Be my watcher! from now onwards, only watch me if you think I should be watched. On January 1st, 2013, from everyone who does BOTH of the above things, I'll be picking two people to give the Points to. some of you were a bit confused about my last journal( the giveaway winner), the last journal wasn't for the Contest! This time it will be sketches , chibi sketches! 300 points and art giveaway! (CLOSED)WINNERS! Congrats for winning this giveaway, drop me a note to claim your prize. As much as I'd like to make gifts to all of you, I don't have the means, so I can just thank you for taking part in this giveaway. Look forward to more giveaways from me. EDIT: Thank you so much everyone for participating! Every fav and comment made me super happy. Tomorrow I'll randomly generate 3 numbers that will win the prizes. Thank you so much everyone for support and kind comments and faves! I officially got 500 watchers and I'm more than happy. closedclosed as of may 23rd, possibly could open again at a later time. hi again everyone, i just made a pixel icon style, and i'm not so sure how i feel about it. i want to try the base i made out on different characters. if you're interested, i will be offering them for 150pts as of right now. maximum of two icons per order, otherwise i will get worked up. please note that these pixels are small, so i may have to simplify details. i currently am not accepting paypal, sorry for the inconvenience. please fill out the form below and comment it on this journal. 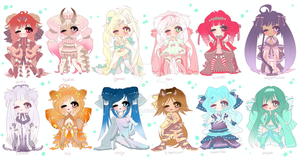 CHIBI Raffle Giveaway! Winners announced! It is a watchers-only giveaway, so you must be watching me on here to enter, Or Following me on twitter!
! !SPRING SALE!! [CLOSED] COMMISSION INFO!uwaah, it was so fast;;; Thank you for all the feedback~! shiimoo but I don't know her friend yet. there is like a million comments on this journal! It's my birthday and almost Thanksgiving so I figure I should give some points out. Choose a friend by typing their name in this journal use :dev: or :icon: codes. WINNERS ANNOUNCED! Adoptable Give Away!Adoptable Give Away!